Instead of frying the pancakes, a non-stick pan is used lightly sprayed with olive oil to help cut calories from fat. 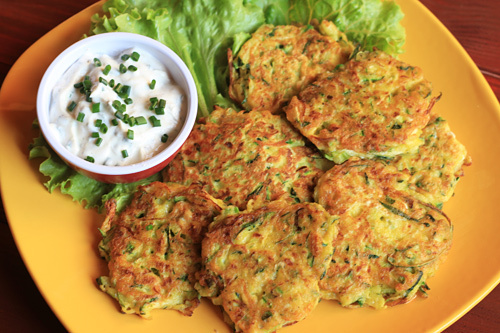 Zucchini pancakes are a great way to use of your bounty of garden zucchini. 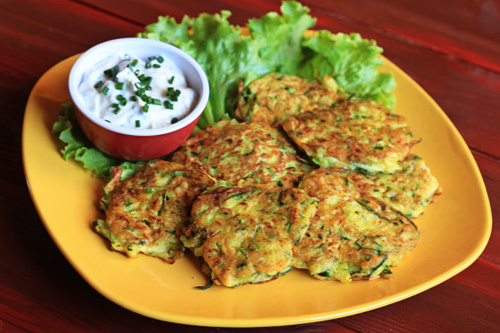 Mix together the grated zucchini, onion, eggs, salt, pepper, oregano, basil, cheese, and baking powder into a bowl. Stir to mix well, then add 6 tablespoons of flour and mix. Mix together the yogurt topping ingredients. Serve pancakes warm with yogurt sauce, or sauce of choice.